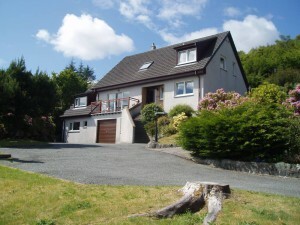 Woodlands bed and breakfast is a four star bed and breakfast located in Portree, on the Isle of Skye, in Scotland. Woodlands has excellent views overlooking Portree bay with the hills of Raasay and Torridon in the distance. It is ideally situated for local amenities, hotels, restaurants and shops. The Isle of Skye is renowned for its spectacular and beautiful scenery with Neist Point, the Coral Beaches and the Kilt rock to name a few. It is a great place to go walking – the famous Cuillin Hills and the Trotternish peninsula being the most popular! Here you can enjoy the local wildlife – sea eagle and dolphins can often be spotted around the coast. A boat trip from Elgol into Loch Coruisk, the heart of the Cuillins is an unforgettable experience. A day excursion to Harris and Uist is also possible as the ferry departs from Uig, half an hour drive from our Bed and Breakfast. Portree, being centrally located, is ideally positioned for touring the island.